Free parking is available adjacent to the Archive for a limited number of vehicles. Located in Warner & Sons’ original Grade II listed textile mill in Braintree, Essex, the Warner family’s connections with the textile industry date back at least to the late seventeenth century, when William Warner worked as a scarlet dyer in Spitalfields, London. The Archive Gallery displays over 100 designs through temporary displays, offering a view of the past and inspiring the designers of the future. The William Morris display celebrates the relationship between designer William Morris and Warner & Sons, looking at their important role in developing and supporting British design and manufacture. There is a wonderfully rich and important group of flat textiles, paper designs and fragments. 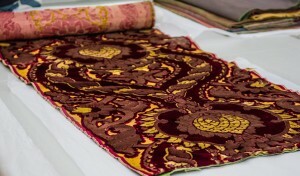 Samples include 18th century French hand-printed cottons, embroidered prayer caps from Africa, paper designs for woven ribbons, shawls and point paper designs for woven silks. Although comprising a few complete garments and accessories, the majority of the fabrics are pieces from dresses or accessories, such as sleeves, bodice sections, dress panels, collars and tambour decoration. Amongst the Archive’s 18th century treasures is a rare example of a toile de Jouy, printed in Jouy en Josas under the direction of Christophe Philippe Oberkampf, the pioneer of toile de Jouy in the 18th century. The Toile de Jouy cloths were printed in 21 metre lengths between 80 centimetres and one metre wide – a dress à la Française took nearly nine metres of fabric to make. The whole piece would have a pink hue and so would be staked out in the sun, printed pattern side down, and sprinkled with water six times a day for six days. This would bleach the background to white and leave the madder printed pattern strong. 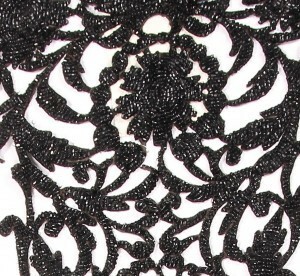 Tambour work, also known as French embroidery beading. 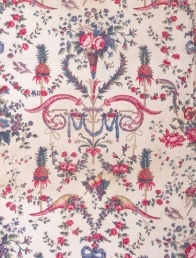 A rare example of a toile de Jouy, printed c 1775 in Jouy en Josas under the direction of Christophe Philippe Oberkampf.